Temperatures last year were at least the third warmest on record and the hottest during a non-El Niño year, according to the world’s leading science agencies. The Earth broke a three-year streak of record heat in 2017, but the year’s average temperature remained the highest recorded without a boost from a warmer Pacific Ocean, science agencies around the globe reported Thursday. The average annual temperature across land and sea was 1.51 degrees Fahrenheit (0.84 degrees Celsius) warmer than the 20th-century average, according to data from the National Oceanic and Atmospheric Administration. That makes it the third-warmest year in a global climate record that dates back to 1880, after 2016 and 2015. NASA had a slightly different finding, rating 2017 second only to 2016 and an annual average at 1.62°F (0.9°C) over a 1951-1980 baseline. But in either agency’s calculations, as well as those of their counterparts in Britain and Japan, 2017 was in the top 3 — and it was the warmest year without a boost from the periodic Pacific warming phenomenon known as El Niño, which catapulted 2016 and 2015 to the No. 1 and 2 slots. “The planet is warming regardless of what’s going on in the tropical Pacific,” said Gavin Schmidt, director of NASA’s Goddard Institute for Space Studies. Thursday’s US findings roughly concur with numbers from the Japanese space agency JAXA and Britain’s weather service, the Met Office. Both agencies released data earlier Thursday that ranked 2017 third. Japan’s analysis put 2017 at 0.39°C (0.7°F) over a 1981-2010 average, compared to the 0.45°C recorded in 2016. The Met Office put 2017 at a hair under 1°C (1.8°F) over an 1850-1900 baseline and 0.38 C over the 1981-2010 period. But while different agencies have reached slightly different numbers, the long-term trends “are all very clear and independent of who is doing these analyses,” Schmidt said. That increase is driven by human emissions of planet-warming carbon dioxide and other gases, which continue to build up in the atmosphere despite worldwide efforts to reduce them. Though a few cool spots appeared, mostly in the Pacific and North Atlantic oceans, “The planet is warming remarkably uniformly,” Schmidt added. The past few years have seen some dramatic manifestations of that trend, with sea ice at the poles retreating sharply from past high marks and a notable number of extreme weather events. Earlier this month, NOAA reported that 2017 was the third-warmest year on record in the continental United States, and the country saw 16 weather or climate-related disasters that inflicted $1 billion or more in damages — including hurricanes Harvey, Maria, and Irma, a deep drought in the upper Great Plains states, and massive wildfires in California and the mountain West. The successive records set in 2015 and 2016 were driven in part by a strong El Niño, a cyclical pattern that occurs when the eastern and central Pacific Ocean warm up. The 2015-2016 El Niño brought warmer, wetter weather to the Northern Hemisphere but fueled intense drought and heat waves across Africa, Southeast Asia, and Australia. 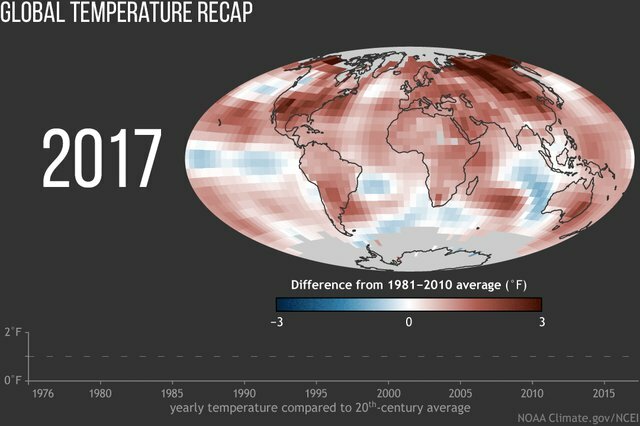 The 2017 figure also tops 2014, another non-El Niño year that was the first of three straight annual records. Nine of the top 10 warmest years on record have occurred since 2000, with the El Niño year of 1998 coming in at No. 9. And last year was the 41st in a row to be warmer than the 20th century average.